Few people while taking up a new job have the flexibility to work as an employee or independent consultant (also known as contractor or freelancer). If planned properly consultants have lower tax outgo for the same CTC (Cost to company). With Budget 2016 introducing presumptive taxation for some professionals like legal, medical accountancy, architect, IT consultancy etc. this makes even more sense. We tell you why or why NOT you should work as consultant or employee? Employee Vs Consultant: How Income Tax Treats them? Income tax differentiates the way/source income is earned. In case of employees the salary is classified as “income from salary” while for consultant the income is classified as “income from business or profession”. This is important as all tax benefits are based on this classification. Also Read: How to Pay 0 Income Tax on Rs 11 Lakh Salary? Why Consultant is better than Employee? We give you five reasons as to why taking role of consultant is better than regular employee. The tax on salary is deducted on basis of tax slab while in case of consultants the tax is deducted at 10%. 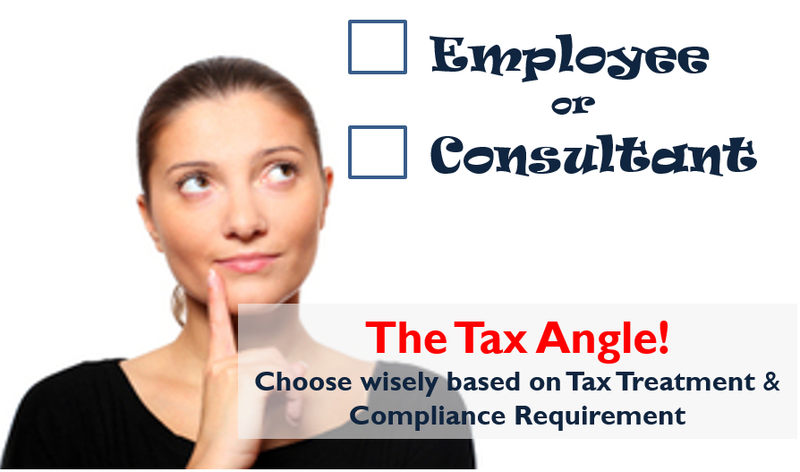 However consultants have to take care about their advance taxes are submitted on time to avoid any interest on tax. Employees have to depend on their employer to structure their salary. The problem a lot of companies do not offer tax efficient salary structure. This is mainly because of laziness or fear of compliance with tax authorities. In case of consultants they can balance their income & expenses in way that their total outgo is minimized. Also Read: What is the Maximum Income Tax You can Save? Employees are not able to avail all tax benefits (even after the company offers) because of certain constraints. For example many employers offer car plan where if you buy car through company policy you can save a lot in taxes. But these are offered to employees after a certain position and/or tenure. Also there is a time limit to buy back the car. With job change happening so frequently, employees do not opt for such plans. For contractors there is NO such obligation. Consultants can easily deduct interest on car loan, insurance, petrol, parking and driver as business expense. Come January/February you need to submit all your investment proofs, rent receipts etc. to your employer to claim tax benefit. To play safe there are times when employers do not accept proofs even though it’s legal. Consultant do not this issue. They are responsible for their tax deductions. Professionals who are covered under presumptive taxation can lower their tax outgo substantially as they just need to state 50% of their gross receipts as income. However they cannot take any other business expense deduction. Presumptive Taxation for professionals was introduced in Budget 2016 under a separate section 44ADA. Under this scheme the income is presumed to be 50% of the gross receipts. So for CTC of Rs 100 the taxable income for consultant is Rs 50 only. The gross receipts (CTC) should be less than Rs 50 lakhs. You can take benefit of all chapter VIA deductions which include Section 80C, 80D, etc. along with Home Loan interest deduction, etc. There are certain tax benefits like house rent allowance, leave travel allowance, conveyance allowance and uniform allowance which are available to employees only. However consultants can deduct all eligible business expenditure incurred in providing consultancy services along with depreciation on assets like AC, furniture, computer, phones and other business assets used for providing services. Employees have some benefits like group life, disability & health insurance which are subsidized by employers which is not available for consultants. Retiral benefits like Gratuity, PF, leave encashment etc. are available only to employees. Consultants have to fend for themselves. Consultants have to comply with additional requirements like service tax, audit of accounts by a Chartered Accountant, pay advance taxes, etc. which are not required by employees. Employee Vs Consultant: Who Pays More Taxes? We take an example where a lawyer has option to work as an employee or independent consultant. He has been offered Rs 15 lakh as CTC. What should he choose to work as? Below is the salary structure, which is pretty tax efficient! Assuming he pays Rs 40,000 monthly rent, he would get 100% HRA exempted from tax too. So as an employee the taxable amount would be Rs 8,89,400 (Basic Salary + Special Allowance). As an independent consultant he can take benefit of Presumptive Taxation u/s 44ADA and his taxable amount would come to Rs 7,50,000 (50% of 15,00,000). So if our lawyer friend choose to work as consultant he can easily save Rs 28,634 in taxes which is almost half of what he pays as employee! In most cases consultants/freelancers have more tax efficient income as compared to employees! Employee or Consultant: What should you choose? As we stated above consultants have an upper hand compared to employees in terms of tax outgo. However this comes at an increased risk of job loss and increased compliance. Choose wisely! Very detailed article Amit. Thank you. I want to know how the maths fair if my receipts exceed more than 50 lakhs? What precautions does one need to take while opting for IC vs employee? Also, while negotiating the contract how does one can ensure to save maximum tax as IC? What are the Tax Code of Professionals which can opt for Section 44ADA for AY 2018-19 ? A very informative article. I want to understand 1 thing though. Does employees have upper edge over consultants while applying for loan ? Be it any loan ( credit card, home loan, auto loan etc. ? My employer is giving me flexibility to opt for consultant instead of regular employee.